I got this book from my dad last year: P.R. Garriock's Masters of Comic Book Art published in 1978. I don't believe he was reading comics at that time, so I don't know why he had it, but it makes for an interesting look. The thing about highlighting "masters" of any medium is, of course, that the very nature of the term suggests a subjective grouping. Who's to say one individual is more masterful than another? Coming from that perspective, I generally don't expect to 100% agree with anyone else's choices. But Garriock's list is a curious one nonetheless. His entries are: Will Eisner, Harvey Kurtzman, Frank Bellamy, Richard Corben, Barry Winsor-Smith, Jean Giraud, Phillippe Druillet, Wally Wood, Robert Crumb, and Victor Moscoso. Now, he does call this Masters of Comic Book Art so I can't fault him for not including some folks like Winsor McCay or Milton Caniff, who only worked in comic strips. It's kind of a semantic point, but I get it. He also seems to equate "art" with "illustration" and not necessarily "storytelling" so I can kind of see not including someone like Jack Kirby. (Although the Kurtzman examples shown are almost all of the more goofy, cartoony variety.) And this is also 1978 so newer talents like John Cassaday weren't around; even someone like Howard Chaykin had only just started his career. The inclusion of several European creators is pleasantly surprising, but Garriock himself is British so that he would be more conscious of them than a typical comic fan of the late 1970s makes sense. However, it's very much worth noting that, despite the more worldly outlook, there are no Asian creators represented. In reflection, even the American creators looked at seem to have more of a European sensibility. While Garriock does have solid biographies and really well reproduced examples of each creator's work, it still basically boils down to a list of his top ten comic creators. Generally, I'm not all that interested in anyone's top ten, especially if I'm not familiar the person making the list. I have no idea where they're coming from or where their sensibilities lie. 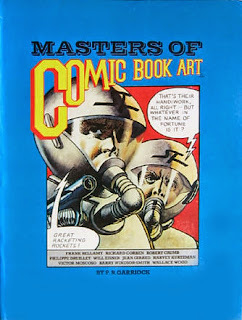 Garriock's book is interesting to me only insomuch as that he does have decent biographies of two creators that I'm not very familiar with (Bellamy and Moscoso), but beyond that, it's mostly a curious artifact notating who a British writer might've thought was great comic book art in the late 1970s.